(a) Our Service: We may collect personally identifiable information about you, such as your full name, phone number, email address, or similar, when you register for an account. If you choose to purchase a product from us, we or our third-party payment processors will collect your payment information. When you visit our websites or use our services, we may receive certain information about you as described below. We regularly send promotional emails and we may send you service related emails related to your account. If you no longer wish to receive these emails, you may opt out of them by canceling your account. All above mentioned Latitude 64 Sites are based on WordPress with integrated plugins and EU compliance addons to accomodate the GDPR guide lines. First and foremost to automatically anonymizing all IP addresses, UserID tracking for Google Analytics hits, eCommerce hits, and form tracking hits, along with disabling Demographics and Interests Reports for Remarketing and Advertising tracking on Google Analytics hits, disabling the author dimension, and to enable the integration for Cookie consent to use Google Analytics to store consent as a Google Analytics event. For more information or to opt-out, please contact us at privacy@latitude64.se. (a) Our Service: We collect data on behalf of our customers who use the Latitude 64 Sites and Services (by embedding our code on their websites) on the behavior of visitors of our customers’ websites or mobile applications. When you visit such websites or mobile applications, we may receive certain information about your behavior including activity, page content, click/touch, movement, scroll, and keystroke activity (in some cases). If you are located in Europe, your IP address, keystroke activity, and personal information are never stored or shared with any third-parties. (b) Information Related To Data Collected For Our Customers: Latitude 64 collects information under the direction of its customers, and has no direct relationship with the individuals whose data it may process. If you are a client of one of our current customers and would no longer like to be tracked by such customer, please contact the respective customer directly. We may transfer personal information to companies that help us provide our service. Transfers to subsequent third parties are covered by the service agreements with our customers. (c) Access And Retention Of Data Controlled By Our Customers: An individual who is a current or former Latitude 64 customer who seeks access or wishes to correct, amend or delete inaccurate data should direct his query to privacy@latitude64.se. An individual who is a client of a current or former Latitude 64 customer who seeks access or wishes to correct, amend or delete inaccurate data should direct his query to to the respective customer first and then, if no response is obtained or such response is not satisfactory, should contact privacy@latitude64.se. If we receive a request under this provision, we will acknowledge it within seventy-two (72) business hours and handle it promptly. We will retain personal data we process on behalf of our customers for as long as needed to provide our services. Latitude 64 will retain this personal information as necessary to comply with our legal obligations, resolve disputes and enforce our agreements. We use automatically collected information and other information collected on the Service through cookies and similar technologies to: (a) personalize our Service, such as remembering a User’s or Visitor’s information so that the User or Visitor will not have to re-enter it during a visit or on subsequent visits; (b) provide customized advertisements, content, and information; (c) monitor and analyze the effectiveness of Service and third-party marketing activities; (d) monitor aggregate site usage metrics such as total number of visitors and pages viewed; and (5) track your entries, submissions, and status in any promotions or other activities on the Service. You can obtain more information about cookies by visiting http://www.allaboutcookies.org. (a) We use the information that we collect to operate and maintain the Latitude 64 Sites and Services and to respond to your questions and concerns. The legal basis is section 6(1)(f) of the EU General Data Protection Regulation (GDPR). (b) If you have given your consent, we use the information that we collect to send you marketing communications in our newsletter. The legal basis is section 6(1)(a) of GDPR. (a) Personally Identifiable Information: Latitude 64 will not rent or sell your personally identifiable information to others. We may store personal information in locations outside the direct control of Latitude 64 (for instance, on servers or databases co-located with hosting providers). Any personally identifiable information you elect to make publicly available on our Sites, such as posting comments on our social media pages, will be available to others. If you remove information that you have made public on our Sites, copies may remain viewable in cached and archived pages of our Sites, or if other users have copied or saved that information. (b) Non-Personally Identifiable Information: We may share non-personally identifiable information (such as anonymous usage data, referring/exit pages and URLs, platform types, number of clicks, etc.) with interested third parties to help them understand the usage patterns for certain Latitude 64 Services and those of our partners. Our partners also have the option to publish the results for their websites on the Latitude 64 Sites. Such results consist solely of non-personally identifiable information. If you choose to publish such results on the Latitude 64 Sites, you understand and agree that this information, along with any personally identifiable information you choose to make available in connection with such results, will be made publicly available. By publishing your results on the Latitude 64 Sites, you agree that you have obtained all necessary consents to make such information public and that doing so will not violate any laws. If you remove information that you have made public on the Latitude 64 Sites, copies may remain viewable in cached and archived pages of the Latitude 64 Sites, or if other users have copied or saved that information. Non-personally identifiable information may be stored indefinitely. (c) Instances Where We Are Required To Share Your Information: Latitude 64 will disclose your information where required to do so by law, if subject to subpoena or other legal proceeding or if we reasonably believe that such action is necessary to (a) comply with the law and the reasonable requests of law enforcement; (b) to protect the security or integrity of our Sites and Services; and/or (c) to exercise or protect the rights, property, or personal safety of Latitude 64, our users or others. (d) What Happens In The Event Of A Change Of Control: We may buy or sell/divest/transfer the company (including any shares in the company), or any combination of its products, services, assets and/or businesses. Your information such as customer names and email addresses, and other User information related to the Latitude 64 Sites and Services may be among the items sold or otherwise transferred in these types of transactions. We may also sell, assign or otherwise transfer such information in the course of corporate divestitures, mergers, acquisitions, bankruptcies, dissolutions, reorganizations, liquidations, similar transactions or proceedings involving all or a portion of the company. You will be notified via email and/or a prominent notice on our Site of any change in ownership or uses of your personal information, as well as any choices you may have regarding your personal information. (f) Testimonials: We display personal testimonials of satisfied customers on some of our Sites in addition to other endorsements. With your consent, we may post your testimonial along with your name. If you wish to update or delete your testimonial, you can contact us at privacy@latitude64.se. Storage and Processing. Your information collected through the Latitude 64 Sites and Services may be stored and processed in the United States, Europe, or any other country in which Latitude 64 or its subsidiaries, affiliates or service providers maintain facilities. Latitude 64 may transfer information that we collect about you, including personal information, to affiliated entities, or to other third parties across borders and from your country or jurisdiction to other countries or jurisdictions around the world. How We Protect Your Information. Latitude 64 is concerned with protecting your privacy and data, but we cannot ensure or warrant the security of any information you transmit to Latitude 64 or guarantee that your information on the Latitude 64 Sites and Services may not be accessed, disclosed, altered or destroyed by breach of any of our industry standard physical, technical or managerial safeguards. When you enter sensitive information (such as log in credentials) on our registration or order forms, we encrypt that information using secure socket layer technology (SSL). No method of transmission over the Internet or method of electronic storage, is 100% secure, however. Therefore, we cannot guarantee its absolute security. If you have any questions about security on our Site, you can contact us at privacy@latitude64.se. We use an outside help platform, and a credit card processing company to bill you if you purchase services. These companies do not retain, share, store or use personally identifiable information for any other purposes. Privacy Shield. Latitude 64 complies with the EU GDPR framework as set forth by the European Union regarding the collection, use, and retention of personal data from European Union member countries. Latitude 64 has certified that it adheres to the requirements of notice, choice, onward transfer, security, data integrity, access and enforcement. Compromise of Personal Information. In the event that personal information is compromised as a breach of security, Latitude 64 will promptly notify our customers in compliance with applicable law. Enforcement and Dispute Resolution. In compliance with the EU Privacy Shield Principles, Latitude 64 commits to resolve complaints about your privacy and our collection or use of your personal information. EU Subjects with questions or concerns about the use of their Personal Data should contact us at: privacy@latitude64.se. If you do not receive timely acknowledgement of your complaint, or if your complaint is not satisfactorily addressed by Latitude 64, EU Individuals and Data Subjects should go to http://bbb.org/EU-privacy-shield/for-eu-consumers/ for more information or to file a complaint. The services of the BBB EU Privacy Shield will be provided at no cost to you. Finally, as a last resort and in limited situations, EU Individuals and Data Subjects may seek redress from the Privacy Shield Panel — a binding arbitration mechanism. (a) If you have an account with Latitude 64, we will retain your information for as long as your account is active or as needed to provide you services. We will retain and use your information as necessary to comply with our legal obligations, resolve disputes and enforce our agreements. 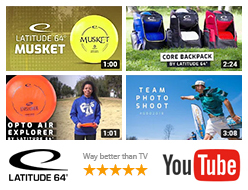 (b) If you are a visitor to the Latitude 64 Sites we will retain your information for as long as necessary. Please revisit this page periodically to stay aware of any changes to this Policy, which we may update from time to time. If we modify the Policy, we will make it available through the Sites, and indicate the date of the latest revision, and will comply with applicable law. Your continued use of the Sites after the revised Policy has become effective indicates that you have read, understood and agreed to the current version of the Policy. Please contact us with any questions or comments about this Policy, your Personal Data, our use and disclosure practices, or your consent choices by email at privacy@latitude64.se.